This World Diabetes Day, noted anthropologist Ida Nicolaisen offers insights from her research among indigenous peoples and work with the World Diabetes Foundation to explain why understanding family organisation, culture and values is key to defeating diabetes. Meal preparation in India, where mothers-in-law traditionally have considerable say over household matters. Photos courtesy of WDF. On November 14, many around the world will pause to mark World Diabetes Day. This year’s theme is The Family and Diabetes – and it is wisely chosen, I believe. Decades of work with anthropology and healthcare have convinced me that diabetes is truly a family issue. In most parts of the world, people with diabetes live with their families. They eat the same food and share assets, including money, and when diabetes hits, the disease invariably becomes a family issue. In less affluent families, not to speak of those who are truly poor, the cost of treatment is a serious, at times prohibitive drain on family assets, even when treatment is free. This is so not only because the price of medicine is very high for the impoverished, but also because transportation of the patient and accompanying family members to clinics is an economic barrier which can determine whether a patient receives proper treatment, or not. Families are organised and function in very different ways throughout the world. Should assets be set aside for the treatment of a family member, or spent on food, education of a child, setting up a business, or sending a member off on migration? The nature of family relations, the ways in which authority is exercised, and the cultural values held within the family and the wider community have important implications for how people with diabetes are perceived and treated. 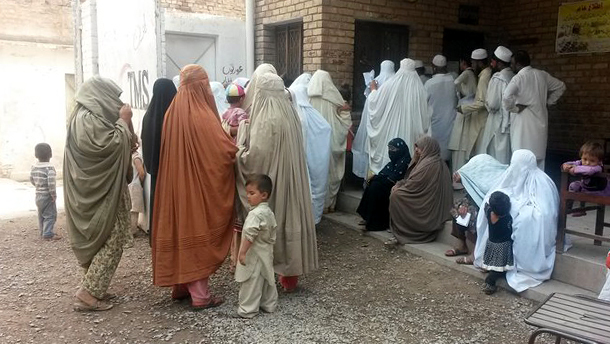 A diabetes clinic in Pakistan, where many women cannot come to health clinics if not accompanied by a male relative or husband. • In male-dominated, honour-sensitive societies in the Middle East, women need the acceptance of their husbands, fathers or brothers to get access to diabetes care. • Among other Muslim societies, such as the nomadic Tuareg people of West Africa, women make such decisions on their own. They are unveiled while the men are veiled, own the tents and have considerable economic and personal leeway. • In India, it is customary that a Hindu woman moves in with her in-laws, and that the mother-in-law and her daughter-in-law cook together. If the younger woman is diabetic, she may be highly dependent on her mother-in-law for the right nutrition and also acceptance that she receives treatment. Throughout the world, the reputation of a family is closely associated with its hospitality. The very best food is served when guests arrive, and often there is food in abundance. With the introduction of processed food, these customs and underlying values have become serious impediments to the health of entire societies. In some societies, such as Tonga, Samoa and other Pacific Islands, guests are expected to eat as much as they can. If they do not, it’s not only impolite but – if the host is a relative - can be interpreted as a rejection of the host’s efforts and the value of family ties. Even as a visitor to the Pacific Islands, one cannot help noticing the great many people wearing mourning clothes, often because diabetes has taken its toll yet again within the family. The foods people appreciate and value the most vary from culture to culture. In Buddhist societies, gifts to the monks traditionally contain butter and sweets, for example. With economic growth, these items are now available in abundance with the result that monks suffer disproportionately from diabetes. While there have been efforts in Thailand to change this custom, they have not yet given sufficient results. One reason the diabetes pandemic is taking off even among the poor, I believe, is that all over the world, people love to spoil their children. I have witnessed this first-hand during extended research in Borneo, Malaysia, where even families with hardly any money will not reject a child who asks for sweets. If there is a little shop there will also be long queues of children buying sweets and - when there’s a bit more money - soft drinks as well. 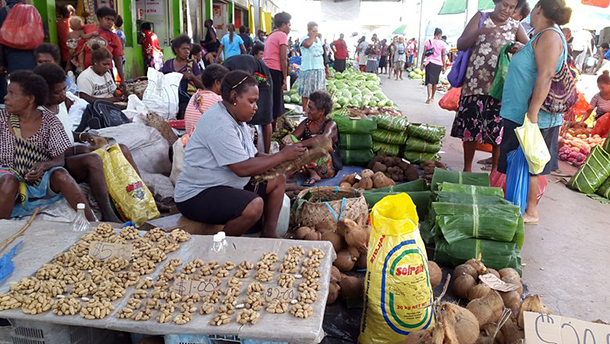 A market in the Solomon Islands, where food should preferably be served and consumed in abundance. The escalating tsunami of people suffering from diabetes poses major challenges for individuals, families, and societies world-wide. The numbers are staggering – prevalence is reaching 13% in the US, 11% in China and nearly 20% in Saudi Arabia and the Emirates. But even harder to fathom, perhaps, is that diabetes is threatening not only the wealthiest countries but also the less privileged, the poor in the worlds’ slums, and millions of indigenous peoples worldwide. Among many Native Americans and the inhabitants of the Pacific Islands, diabetes reaches such inconceivable rates as more than 24% on Nauru and 33% in the Marshall Islands. The constantly increasing number of diabetics on these islands has specialists warning of possible extinctions similar to those which occurred when measles first arrived. 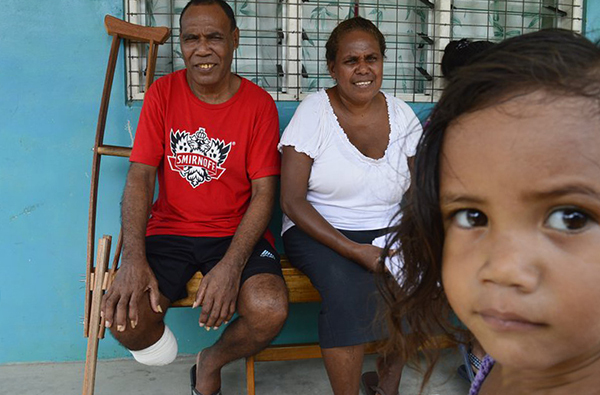 A patient and his family at a diabetes clinic in the Pacific Islands. Diabetes is placing huge physical, emotional and financial strains on individuals and their families. To help them manage, the world’s health systems must be sensitive to the specifics of family organisation, authority patterns, values, and the rapid transitions in eating habits occurring around the globe. The diabetes epidemic should also be a wake-up call to the private sector, the big food companies and soft drink producers. They need to realise the crucial role they play for our health as nutrition changes from consumption of family grown produce to industrialised processed diets, and to demonstrate social responsibility accordingly. Only then can we effectively put a brake on this devastating pandemic. Ms Nicolaisen is a Senior Research Fellow at the Nordic Institute of Asian Studies, Copenhagen University, Editor-in-Chief of the Carlsberg Foundation Nomad Research Project and former Vice-Chair of the UN Permanent Forum on Indigenous Issues and the Danish Agency for Development Cooperation (DANIDA) and its Council for Information. An expert in cultural anthropology, socio-economic transformation and the challenges facing developing countries, she has done extensive research among indigenous peoples in West Africa and South-East Asia. She has been a member of the World Diabetes Foundation Board of Directors since 2002.